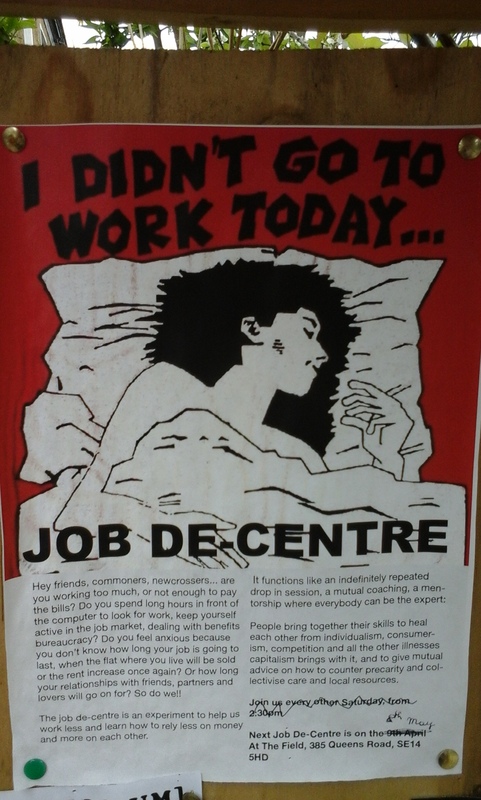 The job de-centre so far has been an event where people think, talk, share experiences about work and unemployment through activities and exercises and not just through discussions. We tried to explore a different perception and understanding of life, not centred on work as the form of life our bodies soak from capitalism. We have been shifting from the production of a critical analysis of our working conditions (so many of us know already how to make that – we saw this every time in the initial round of presentations), to the opening of sensing different possibilities for a life de-centered from work. So far the job de-centre has been too much a series of events that people join as if they were some kind of cultural service provision, no matter how participatory. What we are trying to do now is to move a bit more away from that culture of provision which is so much a habit for most of us, to one of mutuality, whilst getting more practical at the same time. We just had a “closed” session (closed as in no facebook event and no new facebook-people coming) to experiment with a format based on mutual advice: one person talks about her working, economic, life conditions, blockages and difficulties, skills, desires, aspirations, and the others give suggestions on how to make life more “rich” and worth living by connecting with other groups and people, in new cross and london, by fantasising together about collective uses of someone’s skills and desires (in and outside The Field), by thinking together of possibilities and alternatives that an individual might not be able to think alone. The aim of the advise session is not to tell others what to do, it is not to sort out people’s lives, it is not to help people finding a job (!). It is also not to carry on mourning about how fucked up the system is at all levels – we kind of know that, and it’s not about organising campaigns either because there are amazing groups that already do this and we can refer each other’s to those groups (some of them are also engaged in The Field). The advice session is about learning how to open up for each other possibilities to enrich our life beyond work, beyond an individually centred life, beyond competitiveness, joining collective resources and collective struggles at The Field, in the neighbourhood and in other parts of the city. We don’t have recipes for this mutual advice session, we are clumsy and we are learning, but if you are prepared to leave behind the service-provision attitude in order to open up a bit and experiment with mutuality, come and join us. This entry was posted in Uncategorized on May 31, 2016 by newxcommoners. New Cross Commoners is permanently under construction! It will change all the time: "we" don’t want to fix it before this “we” begins to recompose itself, before the “commoners” will gather and exchange ideas, experiences, desires, and before they'll learn how to do that… Still, there is somewhere and something to start with here: New Cross (the geographical boundaries of this area should remain open rather than regulated by postcodes) and commoning (a process of coming together and doing things together that differs from the private and the public/State controlled ways of doing things).